Join us Thursday, 11/16 at the office of Kitchen & Associates for an evening of informal BIM education and networking! Zoltan Toth, Intl. Assoc. 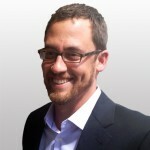 AIA from Graphisoft will explore the ARCHICAD, BIMx, Twinmotion, and Rhino/Grasshopper workflow. Learn how to deploy these software applications to work within one database, increase your productivity, mitigate risk, and deliver a more profitable product. Network with students from local universities (Drexel & Temple) as well as AIA members from AIA West Jersey and AIA South Jersey. If you have been thinking of growing your business, deploying new strategies or want to get out of the ‘fragmented workflow’ rut, this is a can’t miss event! Open to all. RSVP today at the link below! 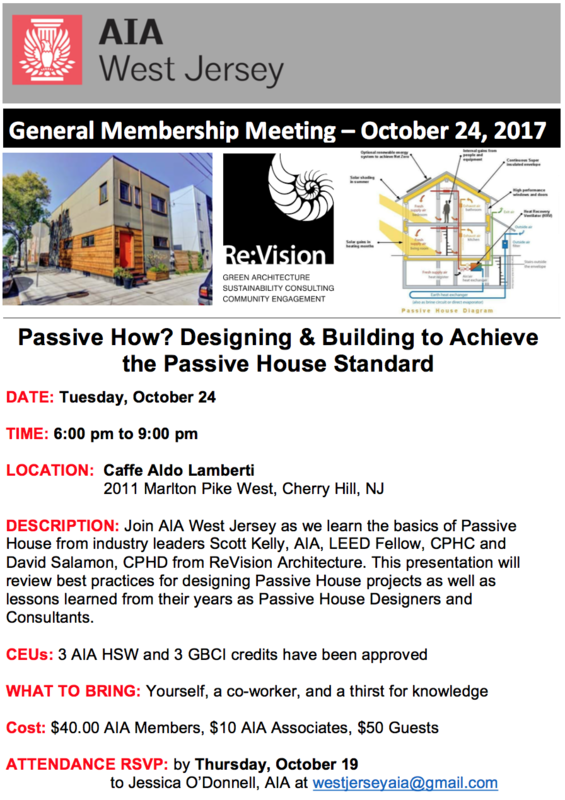 Join us at Caffe Aldo on October 24 for a presentation on Passive House. RSVP by 10/19. Attendees will receive 3 HSW and 3 GBCI credits. Over the years, AIA West Jersey [AIAWJ] has been serving its members by providing quality continuing education programs, field trips, social outings and general meetings for professional camaraderie. We are currently looking for members to get involved with our Executive committee for 2018. AIA West Jersey serves as your voice in state issues affecting the architectural profession. As a volunteer organization, the officers on the Executive Committee serve one or two year terms, continuing on as other capacities and culminating as President. The continuity of the Board allows the Board members to learn from their predecessors, making the transition easier and allowing for an efficient operation of the Chapter. Serving on the AIA West Jersey Executive Committee is a great avenue for professional development. Nowhere else in our profession will you get the opportunity to affect how architecture is practiced in New Jersey. You will also become part of the AIA New Jersey [AIANJ] representation as AIA works on a national scale for the betterment of our profession. It may seem humbling to have this opportunity; however, your voice is exactly what is needed, regardless of your professional status. Board members include project managers and single practitioners, to principals of larger firms. All that is required is a desire to improve the architectural profession. Secretary: Two year term. Responsabilities: attend monthly executive board meetings and keep minutes of the proceedings, coordinate with AIA NJ for AIAWJ event publication notice, update membership roster & coordinate with AIA NJ, assist the president and president elect with newsletters & email blasts, and publish relevant AIA information on AIA West Jersey social media outlets. EPiC Section Director [Emerging Professionals Community]: One year term. Responsibilities: attend monthly executive board meetings, serve as the conduit between AIA NJ EPiC and AIA West Jersey through a monthly teleconference and assist the executive board with developing & planning Emerging Professional events (socail, networking, educational). Trustee: One year Term. Responsibilities: attend montly executive board meetings and assist the executive board with developing & planning general membership meeting topics. We encourage you to become involved and help shape your local AIA Component – no previous board experience is required. Interested candidates should email a brief statement of interest (500 words maximum) to Mark Barone, AIA at westjerseyaia@gmail.comor mail a written statement of interest to P.O. Box 4015, Cherry Hill, NJ 08034. All statements of interest must be recieved by end of business on October 30, 2017. Please reach out if you have any questions about getting more involved with AIA West Jersey. We look forward to hearing from you! AIA Grassroots 2017 – A Leadership Conference – Washington D.C. The 2017 Grassroots conference is attended annually by the leaders of AIA National, State and Local Components and offers the opportunity to learn about how the Institute operates and its agenda for the coming year. Attendees also meet and discuss programming ideas with AIA leaders from Components across the country at a number of networking sessions and interactive seminars. This year, I was fortunate to attend as the representative from AIA West Jersey. New Jersey as a whole was well represented with members from each of the state’s six sections in attendance. Not only did we attend, but AIA NJ and WJ Emerging Professionals hosted a seminar on “Building an Emerging Professionals Network” at this national conference. Wednesday, the delegation from New Jersey met for its Regional Meeting and heard reports from Bruce Turner, AIA, the New Jersey Regional Representative on the AIA National Strategic Council and AIA New Jersey President, Ben Lee, AIA. Design Impact Matters: Architects Shape Lives, Opportunities and Challenges for the Profession. Carl Elefante, FAIA, AIA First Vice President, challenged architects to position ourselves and the profession for success by addressing two mandates. First, to proactively plan for growth to accommodate the anticipated population boom from 7 to 10 billion people in the lifetimes of today’s practicing architects. Second, to substantially reduce or even eliminate human causes of climate change resultant from the building sector. Keynote Speakers: Dr. Joan Clos, Executive Director, United Nations Human Settlement Program & Peter Calthorpe, Architect, Urban Designer and Urban Planner. Dr. Joan Clos spoke to conference attendees via video about the recently held Habitat III Conference, held every 20 years, where member nations engage in discussions regarding housing and sustainable urban development. Peter Calthorpe shared highlights from 30+ years of work that reflect global trends towards New Urbanism planning principles. Mr. Calthorpe emphasized towns and cities with a diverse users and uses, streets focused on the pedestrian scale that promote human interactions, and built to be environmentally sustainable. Conference attendees were treated to four consecutive talks on key issues for cities in the century ahead. The four presentations were: Walkable Cities, by Jeff Speck; Heritage Cities, by Jean Carroon, FAIA; Resilient Cities, by Michael Berkowitz; and 21st Century Cities, by Thomas Dellessio. After the talks members selected one of four break-out sessions on each topic to attend for further discussion and analysis. The discussions were facilitated by members of the Strategic Council, and attendees’ responses will be complied and reported out to membership later this year. Members received information regarding a number of grants available to components and the Component Excellence Awards were announced. One particular program was organized by AIA Phoenix, entitled Arizona Kids Build, where K-8 students learned about the process of architectural design over the course of several weeks by designing and building a model of their our shade shelter guiding by AIA Architect members. In the evening, conference attendees enjoyed some light fare and cocktails while touring AIA National Headquarters. We met face to face with AIA staff, networked with colleagues and viewed an exhibit featuring designs by emerging professionals. Over breakfast conference attendees network with another leaders from similarly sized components. I had the pleasure of meeting and discussing our local initiatives with leaders from Tampa Bay, Long Beach Austin and Spokane. My final seminar, “Building an Emerging Professional Network”, was not only attended by AIA NJ and AIA WJ members, it was presented by us. AIA NJ Emerging Professional Community (EPiC) and AIA California’s Academy for Emerging Professionals (AEP) presented each organization’s structure, successes and failures to a packed room of component leaders. Jessica O’Donnell, AIA WJ Secretary, and AIA NJ EPiC Chair was a featured presenter. In the final general session, ARCHITECT magazine editor, Ned Cramer moderated a panel discussion with the candidates for national office: 2018-2020 At-large Director (one to be elected) Emily Grandstaff-Rice, FAIA and Daniel S. Hart, FAIA, and 2018-2019 Treasurer Patrick Panetta, AIA. During the Town Hall, questions submitted from members prior to the conference, as well as inquiries from the members in attendance were addressed by Institute Leaders: Thomas Vonier, FAIA, AIA President, Carl Elefante, FAIA, AIA First Vice President, Heather Koury, Hon. AIA, CACE President, Robert Ivy, FAIA, AIA Chief Exectuive Officer, and Jason Winters, AIA, Moderator Strategic Council. Mayor Catherine Pugh of Baltimore gave the final keynote address, calling on architects to get involved in city planning and team up with elected officials to use their unique problem solving skills to improve communities. Mayor Pugh discussed her work with AIA Batlimore to realize the Baltimore Design School, a new community school offering students an education in architectural, fashion and product design while providing public meeting spaces for the surrounding community. If you have made it this far, you may be a good candidate for leadership in the local component. I encourage you to start small and ask your local AIA component leaders to help organize a meeting, or take RSVPs. Then jump in on a Committee, or take on another leadership role in an area you are passionate about. Email us at westjerseyaia@gmail.com to begin developing your leadership skills today. Maybe it will be you that gets to represent AIA West Jersey at Grassroots in the years to come! 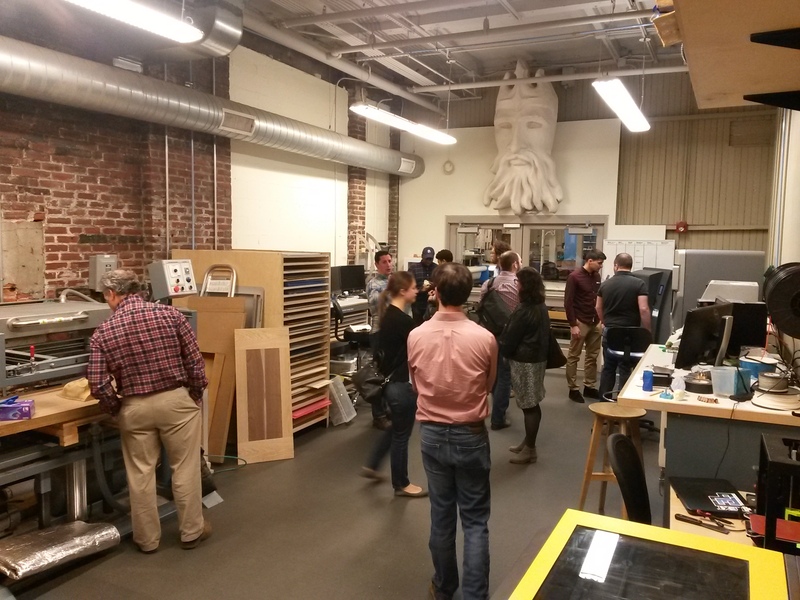 On Friday February 24th, the AIA-West Jersey Emerging Professionals Community (EPiC) observed “Tech Month”, by taking a guided tour of NextFab, a local co-working facility and “maker-space” that provides technology training, production equipment and automated fabrication expertise to start-ups and creatives. The event was well attended, and included representatives of AIA-WJ, Philadelphia Emerging Architects (PEA) and the Philadelphia chapter of the National Organization of Minority Architects (PhilaNOMA). We were also joined by the project architect of the facility Jackie Gusic, AIA of Inhabit Architecture & Design, who provided insight into the background and design of the project, an adaptive reuse of a warehouse located among the building supply stores on Washington Avenue in South Philadelphia. Eric Kaplan, Business Development Manager of NextFab, directed our tour and demonstrated the architectural applications of their digital automated production equipment. The metal and wood shops located on the main level featured some of the largest pieces of machinery, including water-jet and plasma cutters for metalwork, and two CNC mills for composites and wood-based materials. The advantages of 3D scanning for reproductions of architectural artifacts and sculptural objects were evident from the CNC milled prototypes that Mr. Kaplan presented. Afterwards, we toured the upper level which included the 3D printing and laser-cutting studio, where we had the chance to observe a 3D printer in action, creating a prototype of an architectural extrusion. After the tour, the group headed to nearby Los Camaradas restaurant to enjoy some Mexican cuisine and discuss upcoming events and opportunities for professional development. 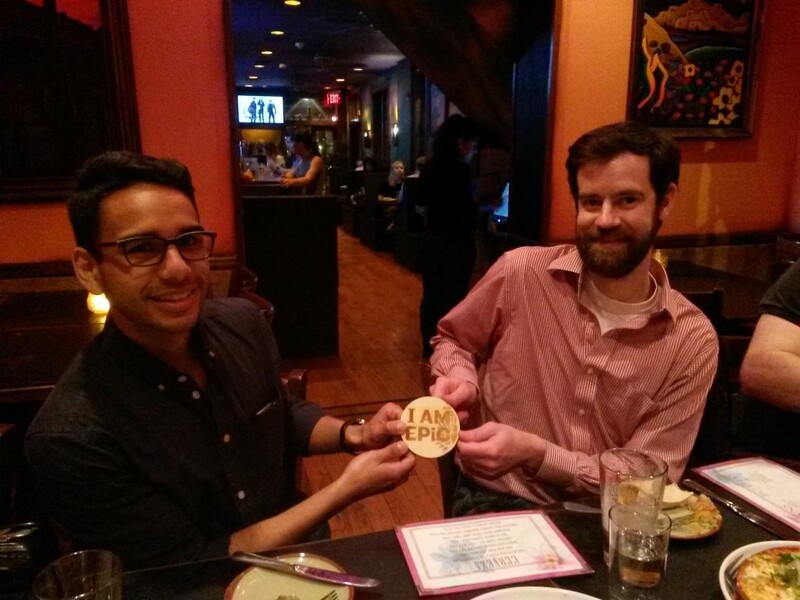 By the end of the night a lucky participant was awarded a door prize custom laser-etched by NextFab, a plywood medallion emblazoned with the “I AM EPiC” logo. Thank you to all who participated to make this event a success! The CANstruction Pennsauken 2017 Awards Reception was held this past Wednesday, February 22, 2017 at the Rutgers University Camden Campus. A panel of judges — including local architects, dietitians, community activists and representatives from the Food Bank of South Jersey — voted on categories including Most Cans, Structural Ingenuity, Best Meal, Best Use of Labels, and Best Original Design. In addition to these categories, there was a sixth award that was judged solely by the Food Bank of South Jersey representatives titled, Food Bank Favorite. 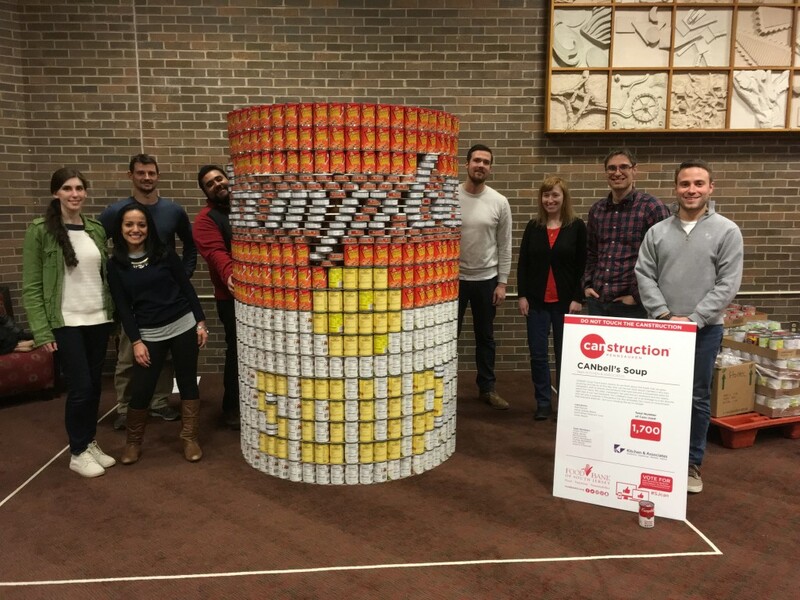 AIA West Jersey sponsored team, Kitchen and Associates, took home the “Food Bank Favorite” trophy for their “CANbell’s Soup” CANstructure. Measuring in at over 6 feet tall, 4 feet in diameter, and containing a total of over 1,700 cans, the design resonated with Food Bank representatives for its ties to Campbell’s Soup in Camden and being such a well-loved food by so many people. Although simple in shape, the detailing of the “Campbell’s” lettering was applauded. AIA West Jersey seeks to sponsor this event on an annual basis. This year’s event resulted in 13,461 cans of food donated to the Food Bank of South Jersey. If you or your firm are interested in potential sponsorship of your team, or if you would like to organize a AIA West Jersey team in 2018, please contact us at: westjerseyaia@gmail.com. AIA West Jersey will host the next General Membership Meeting and Dinner Seminar on March 15th at Caffé Aldo Lamberti in Cherry Hill, NJ. 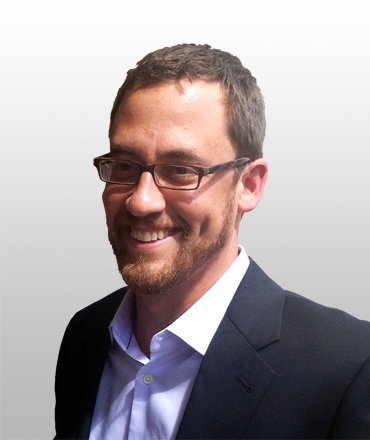 The evening will feature a presentation on Applying Swedish Innovations in Residential Construction Systems, by Gregory LaVardera, AIA. Architects are witnessing a significant increase in the energy efficiency code requirements for our housing. The best way to meet these new requirements is not always clear. For insight we can turn to Sweden where they underwent a similar revolution in the 1970s. Today, with 40 years of good practice behind them Sweden has efficient solutions to most of our energy efficiency demands. Because Sweden and the US share a tradition of wood framed housing, their techniques can be readily adopted and suggest a way forward for us in North American. Please join us for the upcoming meeting between AIA South Jersey and West Jersey where you will learn how to use social media and Houzz to promote your Architectural Firm. DESCRIPTION: In this course, we will review the steps that you need to take to set up a profile on Houzz and maximize your exposure on the platform. Houzz is the world’s leading resource for homeowners looking for inspiration and ideas for their next home remodeling project. With 20 million monthly visitors, most of whom are homeowners, Houzz has become an important tool for residential trade professionals to showcase their work and get client leads. Houzz is a completely free tool for trade professionals. Note: This is an interactive program. Please bring you laptops, tablets or other devices where you can set up your own Houzz profiles. Free Wifi will be available. ATTENDANCE & DINNER CHOICE RSVP: Friday, September 25, 2015. AIA South & West Jersey Members RSVP to Bruce Turner, AIA at (856) 405-0351 or bdtaia@aol.com with your choice of Chicken Milanese, Eggplant Tower or Prime Rib. *Membership determined by the membership roster as of the date of this meeting. 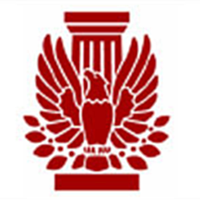 **AIA West Jersey is a registered with the AIA Continuing Education System AIA/CES. This program is pending for approval for 3 LU, which will be reported directly to the AIA/CES for AIA members.